Available in November, if there is still space available at that time. Please press REGISTER as to select your sponsorship level. Thank you for considering exhibiting at the IAGC 24th Annual Conference. We greatly appreciate your support. The IAGC Convention draws over 800 educators, administrators, counselors and parents of gifted children from across the State of Illinois and nearby states over two and a half days. The Convention comprises over 200 presentations. 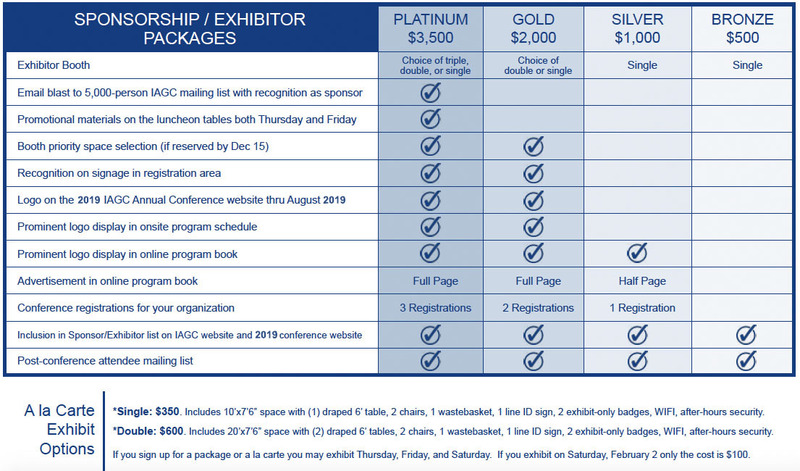 As indicated in the Exhibitor's Matrix, shown below, there are four levels of support to choose from: Platinum, Gold, Silver and Bronze. These all come with the option to stay onsite for Saturday morning, during our Parent Saturday event. Ala carte booth options may be made available in November, if there is still space available. Applications entered before December 15, 2018 will be listed in the program book. The 27 booths available Thursday and Friday are sold on a first come/first served basis, with our highest level sponsors having first choice of location.